Right at the beginning of the month, I wrote about my March Goals and then I promptly took the following week off from blogging. It is amazing what you can accomplish in a week when you step away from the computer. That being said, I thought I would have a lot more knitting progress to show you today, however, I do not! I am almost done with this skein of yarn for the scarf I am knitting for Emma, and actually, I might not need to go for the second skein. I love long scarves for myself, but I don’t want one that is super long for Emma that may get caught when she is out running around. My knitting has become side-tracked again though, and I plan to cast on a new project today…if I can find the right yarn in my stash. My brother and sister-in-law just welcomed their third little one into the world, and because of that, a little newborn knitting is in order! My plan is a hat, one that is very quick, especially if I want to complete it before we go to visit them…very very soon. With my ability to knit slower than molasses, well let’s hope that I will finish the hat before it no longer fits her! My reading, I haven’t done as much reading as you would expect after taking a bit of a blog break. I mentioned in a previous post that I started reading my old Mandie series books to the kids, they are enjoying them. I have also been spending a lot of time looking at book lists for homeschooling. I have finished one “for me” book though. It is called Quitting Church. I had read several quotes from this book in another book, Barefoot Church by Brandon Hatmaker (Jen Hatmaker’s husband), and thought it might be one that I would enjoy reading. Don’t let the title scare you. It is a book about why people in Gen X & Y are leaving the church in droves, everything from “services are too flashy” to “there is more community and depth available online.” It was a fascinating read, and I was nodding my head right along to a lot of it. It examined all manner of churches, too, house churches, Catholic churches, Mega churches, small community churches, Orthodox, non-denominational. I definitely recommend it. One of the best non-fiction reads of this year for me! Overall, it was a nice break, and I am happy to be getting back into the groove. I think the spring weather is definitely helping me feel a little more productive. What are you working on this week? Any good non-fiction books I should add to my list? I've never tried knitting before… I've heard that it is therapeutic, just as adult colouring books are. I may have to try it someday, to ease the stress in my life! I had to take time away from my blog because it was report card time followed by parent teacher conferences. I hear you about how much time you suddenly have when you are not blogging. The book sounds really interesting. I think the reason you are content with the clocks changing is that you home ed. Those of us who have to get children to school (boo!) Find our job a bit harder! I'm very jealous, my husband would not consent to home ed for our big boy. I don't know how to knit but I've always been an avid reader. Unfortunately, life has gotten in the way and I don't get as much time to read as I would like and as I used to read. Hopefully I will have a chance to read more during summer vacation. I do that too, make this huge list of goals and then get overwhelmed and take a blogging break. I hope you'll link your goals up with my goal linkup. 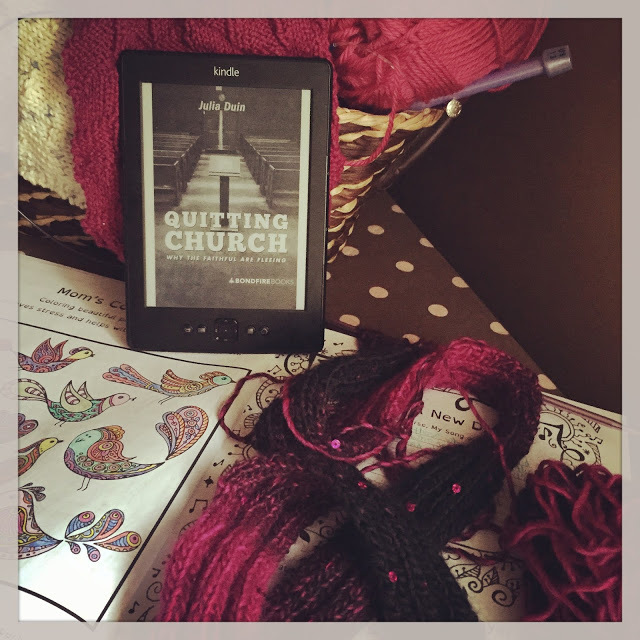 I love to read and blog about books as well, I'm going to have to look into Quitting Church. It's hard enough getting me and my boys to church on the days we go already! I read mostly fiction so I don't have many if any recommendations. lovely knitting!! That sounds like an interesting book! Thanks for the recommendation. I always loved to knit but I never developed my skills. I have set a lot of blog goals, the main ones are: to retouch pictures from my journeys, to write about Hong Kong, to improve my writing skills by reading novels and travel magazines. Taking time off from blog works wonders in so many ways. It's really interesting when you take a step back and realize how much time goes into blogging. Congrats to your brother and sister-in-law! I really want to learn how to knit one day! The hat is going to be super cute. I never learned to knit. I took my girls for lessons on how to knit and one hated it, one loved it but was not very good at it. 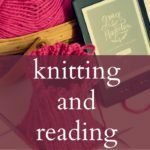 They both taught my son – who was great and then my husband had a fit that he was knitting! And , now no ones knits! That book sounds fascinating! I am going to have to check it out! Thanks for the recommendation! That book sounds like one I would enjoy reading. I myself have reasons for leaving, so I'm interested to see if those same reasons are echoed in the book! There's so much love and warm wishes in your art and creation. Knitting and quilting have been on my list of try outs but never given it serious consideration so far. Creating anything is such a wonderful outlet, refreshes your mind and heart and helps you connect with yourself. I'm sure the new parents to be will love their gifts! Congratulations to you all ! There must be something in the air because my knitting has progressed so slowly of late, too. 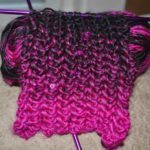 I find that baby knits can really help – having a deadline really helps! That book has been on my list for a while. Your review makes me want to do something about actually reading it! I don't know how to knit but I love the baby knits here! Congratulations are in order for the new mummy and daddy to be. I hear ya on the whole getting side-tracked thing. It happens so much these days. I've created a schedule for myself and a "side-tracked" one to help me stay focused. It's helped me manage my day-to-day. As for my goal this week, I'm focusing on more family time. Beautiful scarf! 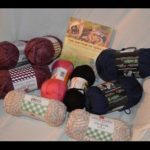 I haven't picked up my knitting needles in months! I was working on an infinity scarf before Christmas for my sister and got so busy with other stuff I haven't had the time to pick it back up. The spring weather has been pretty motivating for me, too. I feel like I am coming out of hibernation! Baby knits! Those are fast (or so I've been led to believe, ha)! I'm also fairly certain this year is the first I've actually noticed a different with daylight savings time. Only in that my alarm went off Sunday morning earlier than I anticipated 😉 Beyond that, it's so very nice to have it be brighter out later in the evening – I've missed the sun! Seriously – I think the knitting fairy is depleting a lot of us lately. I will have to add that book to my list. I love knitting things for babies! Let us know what you make after knitting and giving it. I am so into non-fiction books right now. One of the best I've read is "Non-Violet Communication", I really think this book will be useful for every person in the world! A beautiful, tiny baby hat for a new precious baby! What an exciting time! Congratulations to your brother and sister in love, how exciting. 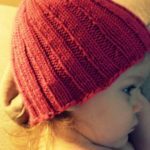 I adore baby hats, they are just so sweet and really they do knit up quick. I just added your book to my reading list, I think my son would like reading it too, thanks so much. It is amazing the progress that can happen in a week! Of course, I am not talking about my knitting or my reading at this point. Instead I am talking about my garden which got a major weeding over the weekend! 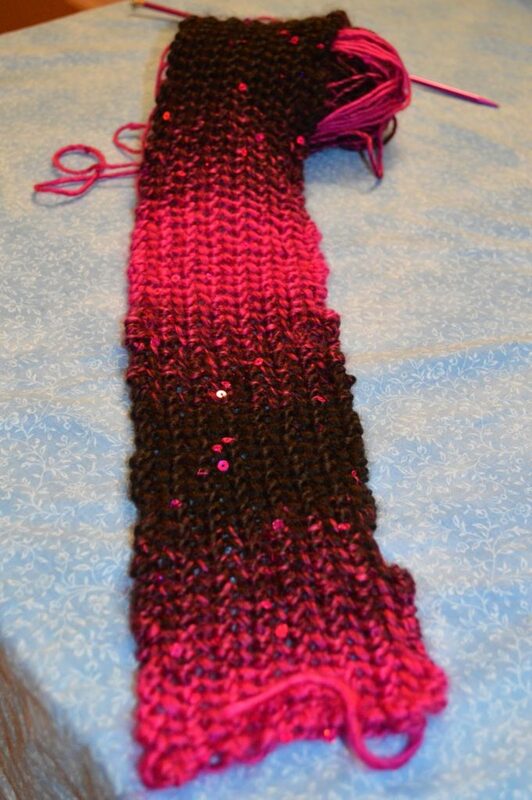 I have made a bit of progress on my scarf though, and that is what matters. I’m sure that soon I will sit down and just finish it, hopefully this week since it seems to want to rain every day. The rainy days drive me indoors and let me sit down a bit…sometimes. 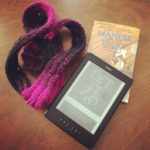 As far as my reading goes, I am still reading Hands Free Mama, and I am still enjoying it immensely. I really like how she gives you “weekly intentions.” I think it is important to be able to follow up the reading with action. One of the intentions I like the most is declaring to your people that you are going hands free. It is all well and good to tell yourself, or even your online community that you want to go hands free, but unless you are excellent at keeping yourself accountable, I don’t think it would work. By telling your family and friends, they will be there to remind you when you are waiting at a restaurant, or going to the playground. The other intention is letting your kids help you with chores. I think that a lot of times I just want to get it done, so I do it myself, but I am missing out on a lot of fun with my kids (my kids are a riot when they help me with the laundry). Sure, it won’t be done exactly how I want it to be, but is it really a big deal if they fold their clothes *wrong* when they put them away? Or is it more important to spend the time with them, and give them another life skill that they will need when they grow up? And one book that I am not reading yet, but very much looking forward to is the last in the All Souls trilogy, by Deborah Harkness, The Book of Life. I have been not so patiently awaiting its release, just to realize that it is not on my library’s e-book site. So now I need to put my name on the list for an actual hard copy of the book, and I am afraid it will be a very long wait. It may be one of those books that I just need to purchase because I want to find out the ending! What are you working on this week? Have you been reading any good non-fiction lately? I need to try that book series again. I tried very hard to get into A Discovery of Witches but just couldn't. The weather pattern here has turned from hot and dry to warm, muggy, and cloudy. Thankful for AC and shade trees. 🙂 Love the little bit of sparkle in your yarn! I showed the girls and they LOVED it! Great work you busy Mama!!! oh, look at those sequins!!! how fun! Tis the season for thunder around here too…love the sequence in your knits. Enjoy your day. Rain due here the next two days as well. 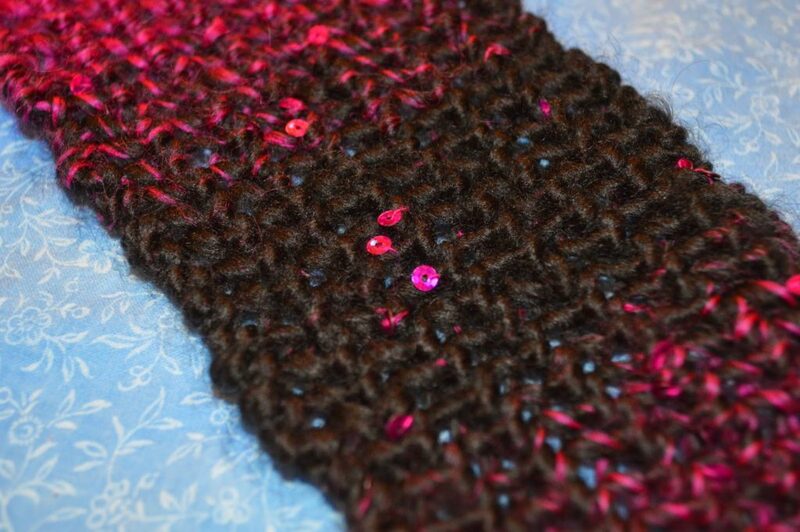 I have cast on with a sequined yarn as well. A sweater for my granddaughter! We have been having storms here that are keeping me inside too, although I do wish the power would stay on. Your scarf is very pretty. I haven't read any of the All Souls Trilogy books, but I will be checking them out now.